Here’s what I can tell you about American voters. We’re the country that brought you Warren G. Harding and Taylor Hicks. We’re the country that decided that Cheesy Garlic Bread is a better potato chip flavor than Sriracha. I kid you not, Sriracha lost. What is wrong with people? So, voting aptitude is probably not our strongest suit as a nation. On Friday I posted my belief that a baseball All-Star should be based on something more than just numbers and on-field statistics. Because, you can lead every single offensive category … every single one … you can be on pace to hit 200 home runs, steal 100 bases and, when necessary, play all nine positions in a single game, while nursing a stress fracture in your leg … but if you failed baseball’s drug test, publicly talk smack about your teammates, or for some strange reason believe that bread is an acceptable potato chip flavor … there is no way … NO WAY … you will ever earn my All-Star vote. Has there been a year when someone didn’t complain about the All-Star roster? No. Every single year someone, somewhere complains. I have no basis for that statement. But, I stand by it anyway, because … well, hey, prove me wrong. 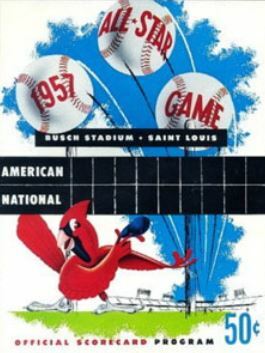 Fans began voting for the starting lineups of the All-Star game in 1947. It didn’t take long for energetic fans to get to stuffing. It came to a head in 1957 when Cincinnatians – with the help of their local newspapers, Kroger Grocery stores, and neighborhood taverns – accounted for half of all the votes cast that year. And, Frick took away the fan vote. Fans elbowed their way back into voting in 1970. And, back to stuffing. ** In 2012, the San Francisco Giants took heat for encouraging their fans to vote and vote and vote. Angry non-Giant fans suggested the computer geniuses of Silicon Valley were all Giants fans and were shamelessly hijacking the online voting system. Others pointed out that Giants’ AT&T Park offers free Wi-Fi, making online voting at the game way too easy. And, who was the unfit All-Star starter in 2012? Giants Third Baseman Pablo “Panda Bear” Sandoval. How’d it work out? Panda Bear was one of the stars of the game that night; his three-RBI triple helped lead the National League to an 8-0 victory. No, I don’t like cheaters. But, I don’t see why teams shouldn’t encourage their fans to support their favorite players. I’m confident that the All-Star game will include the best that baseball has to offer – based on statistical achievement, as well as intangible “nice guy” criteria that I think is the difference between a great player and an All-Star. Because, really, I mean, what’s worse? Buster Posey starting at Catcher for the National League next month or the fact that only 57 percent of eligible voters voted in last year’s presidential election? Can’t decide? Let me help you out. The presidential voting thing is worse. 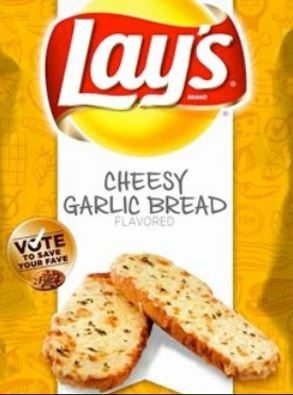 But, the Cheesy Garlic Bread potato chip vote is pretty bad, too. UPDATE!! The potato chip debate is not over. In August, I got the chips … and here’s my post on the taste test. Click here. This entry was posted in Baseball, Baseball History and tagged All Star Game, Boston Red Sox, Cincinnati Reds, Milwaukee Brewers, SF Giants by Jackie, The Baseball Bloggess. Bookmark the permalink. If you come to dinner at my house, what will happen if I put cheesy garlic bread on the menu? Oh My God – this is hilarious! I was siting here laughing out loud!! Thanks! I’m so glad the Boys from Birdland finally got out of Tampa last night … here’s to a good homestand this week! I love this blog post, it’s so fitting I read it again for the upcoming All-Star Game! Now I am certainly biased being a Dodgers fan and all, but you HAVE to go vote for Yasiel Puig to get the final All Star Spot. It might not last, but he’s currently the most exciting player out there. Love the history you write about here in this blog. Great job! As I looked at the final rosters, I felt 2 extremes — first, that the Orioles’ Nick Markakis was overlooked, despite a long, All-Star caliber career and season. But, he’s so unflashy, he gets lost. That said, I agree with you that Yasiel Puig deserves a spot. 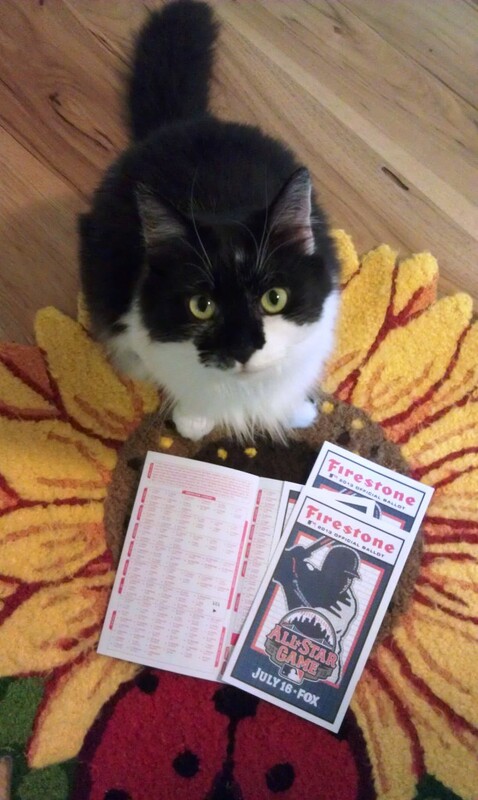 But, for the exact opposite reason: his firecracker month earned him a spot. I’ll miss seeing Markakis there for the AL, but, you win … I’ll vote Puig! And, I absolutely love your blog. Your recent post on the meaning of failure has been something that has stayed with me. You’re so good at making me think. I hope people will check out your blog! Hey it could’ve been worse..could’ve been chicken and waffles, wasn’t that in the running? :) Congrats on FP! Yes … chicken & waffles was the crazy third option, which continues to baffle me. I’m thinking French Fry Flavored Potato Chips should have been one of the choices! Thanks so much for stopping by and reading! I would have voted for Pork Rings over Cheesy Bread Chips any day of the week. MLB All Stars should be picked by the players and not the fans. Players and managers do choose the vast majority of the All Stars, including all of the pitchers. We fans only vote in the starting lineup – a mere 26 percent of the 68 players who will make the trip. I think it’s a nice way to keep the fans interested and involved — after all, if it weren’t for us, there would be no one to watch the game! I honestly can’t believe how badly Markakis gets overlooked every year. I must admit, I did stuff the ballot box with Orange; smartly, MLB limits the online voting to 25 votes. If you vote 25 times, you get a bonus 10 more votes. Of course, that’s per email address. If you have multiple email addresses you can just go to town! If there was a healthy Markakis for all of 2012, the O’s win at least 1 or 2 more games and probably win the AL East last year. I blame Sabathia for breaking his wrist. It makes me grumpy. Hrumph. I think you’re right! The only silver lining in any of that is that Markakis’ injuries last year may have helped Chris Davis get some extended everyday playing time which helped turn him into this season’s Chris Davis. But, still … I think non-Oriole fans have no idea how important Nick Markakis is to the O’s and how good he is, day in/day out. Seriously funny. Who’d have thunk it? Wow! Thank you so much for sharing with your readers … I really appreciate you taking the time to read and reblog! xD It doesn’t really matter. The facts were funny, and that’s what the assignment called for, and it wasn’t specific about how “factual” they were. Loved the post as I am into baseball. You are quite right. The All Star Game participants is fan based with bias not based on actual ability to play. But all elections are swayed by emotions and not real substance. The reference to Harding perked my curiosity. Just as a side bar, I believe he was the only president who may have been secretly murdered. Look up the incidences leading up to his death and you will note some interesting facts. As for being one of the worst presidents ever, well you got me. He made sure his cronies came out on top. Warren Harding is an interesting figure, that’s for certain! The murder thing has been out there for awhile, although I tend to believe he really did get ill because of accidental food poisoning and actually died because he was mistreated by doctors (just like President Garfield, who died because of his doctors). Harding’s wife Florence was shrouded in the murder scandal … there’s a great book about her “Florence Harding: The First Lady, The Jazz Age, & The Death of America’s Most Scandalous President” which is a wonderful read. That book was so well researched, it sort of closed the book on the murder rumor for me. Thanks so much for reading and for your comments! I know that many folks feel like the All-Star Game is a waste of time and suffers because of fan voting. But, the vast majority of the players will be chosen by the players and the managers (74%) … I think it’s fun for fans to have a small say-so in the choosing, while the players/managers are there to “fix” any omissions! Thanks for the information. I will look this book and hope it answers my questions I believe there was a child out of wedlock, a quick cremation, and the fact that Mrs. Harding soon remarried and that husband also suspiciously died. Florence was definitely the power-hungry one in the Harding household. She pushed Warren into nearly every political endeavor and was a generally horrible person. I don’t think I would let her into my house without counting the silver after she left, but I don’t think she murdered anyone. Still … she was pretty sly, so who knows? I don’t agree, I like that bad Cheesy Garlic Bread potato chip vote! I have a friend who thinks any flavor on a potato chip is evil … it’s plain or nothing for him. He was probably outraged to find out that they even voted on this! Thanks for reading and stopping by to comment! Wise insights. I also wish Markakis had been chosen — but I’ll cheer the boys in orange. They are all All Stars in Bmore. Go O’s. Thanks so much for reading … and for taking time to comment. Go O’s!! And what were the other chip choices? Sracha sounds interesting. The three choices were … Cheesy Garlic Bread, Sriracha, and Chicken & Waffles. Not sure how they came up with those choices. But, I put Sriracha on everything … so I thought that it was a natural with chips. Ahh, but it all worked out in the end! My blog post was written in early June and Buster was out on top … but in the past few weeks, the fan vote shifted, and Molina was #1. I’m definitely a Buster fan, but Molina truly deserves the start … and the fans ultimately got it right! You can’t go wrong with either of them for sure. St. Louis had a fairly long home stand so I’m sure that helped. Great post. Thanks so much for taking the time to read and comment … I really appreciate it! I didn’t see where anybody said if any of these chip flavors were actually any good. I didn’t try or vote on these (I like the traditional BBQ) but what did they taste like? Good, bad or just weird. Maybe the garlic bread was the better weird choice. Weird is probably a good guess. I didn’t know a thing about the tasting/voting until after everything was over with. The third flavor under consideration was “chicken & waffles” and I was so baffled as to how they would make a chip taste like that I didn’t even mention it in the post … it made my brain hurt just thinking about it. It’s like the Willy Wonka gum that can taste like a complete meal. Ahh, the marvels of 21st century chemicals and artificial flavors! I think you are underestimating how delicious cheesy garlic bread is. You can always add some Sriracha to a chip, but its a lot harder to smear garlic butter on a chip, sprinkle cheese over it, and bake it in the oven. I see your point, bread flavored chips is akin to saying potato flavored potato chips! that would be pretty funny…I’m sure a lot of people wouldn’t even realize the redundancy. I can definitely see a Boardwalk Fries flavor of potato chips happening.